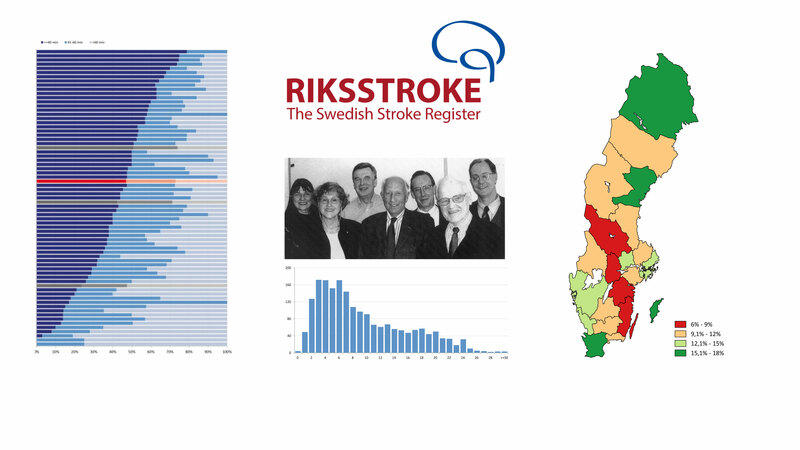 The Swedish Stroke Register (Riksstroke) was founded in 1994. Riksstroke includes registration of acute stroke, with a follow up after 3 months and 1 year. The Stroke policy and quality register research group has several ongoing projects based on data from Riksstroke, and in many studies also using data record linkage to other national registers and data bases. The thesis of Teresa Ullberg explored the 1-year follow up survey in Riksstroke. Important findings included the identification of disparities in Swedish post-stroke care, the lack of a structured follow-up service for stroke, the suboptimal use of secondary prevention. The project of Fredrik Buchwald includes studies on the TIA module in Riksstroke, with a focus on risk factors and therapies in patients with TIA compared with stroke, and in patients with or without a prior stroke. Planned projects include health economic evaluations of stroke care, 3 and 5 year follow-up surveys and studies on stroke occurring during anticoagulant therapy.